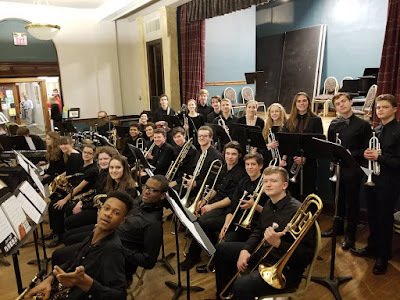 The Wyoming School Music Association, along with the entire Wyoming City Schools Music Faculty, hosted the Sixth Annual Wyoming Winter Music Festival on February 8. Over 60 Wyoming High School musicians performed for the 120 guests at the Wyoming Fine Arts Center. Guests travelled room to room to enjoy different genres of music while enjoying wine and beer plus Station Family + BBQ and Gabby’s specialties. Thanks to all involved for the hard work that went into making this community tradition a great celebration of music in Wyoming! The amazing 30-piece Wyoming High School Jazz Band was the finale for the evening’s festivities. Penny, David, Klarysa, and Kimberly had a great time at the event celebrating the arts in Wyoming. Grace, Emily, and Ian performed for the first time at the event. The high school performers not only helped raise money for their school’s music programs, but they also had a great time performing and celebrating one another’s talents. Colin, Aiden, and Sam stayed for the After Party to listen to their friends in the rock bands. Awkward Silence closed down the After Party. It is a yearly tradition for all the performers to sing “So Long, Farewell” at the end of the evening. Members of the band Stone Fish and their groupies posed for a photo after their After Party performance.